I shared this question and my answer on my instagram. I was not surprise that most people want to spend the rest of their life travelling. Eversince I was I child, I have been dreaming of seeing with my own eyes and experiencing the beautiful things different places could offer. I buy magazines and books about travel. I'm actually working just to save money for travel funds. I will answer the question above. 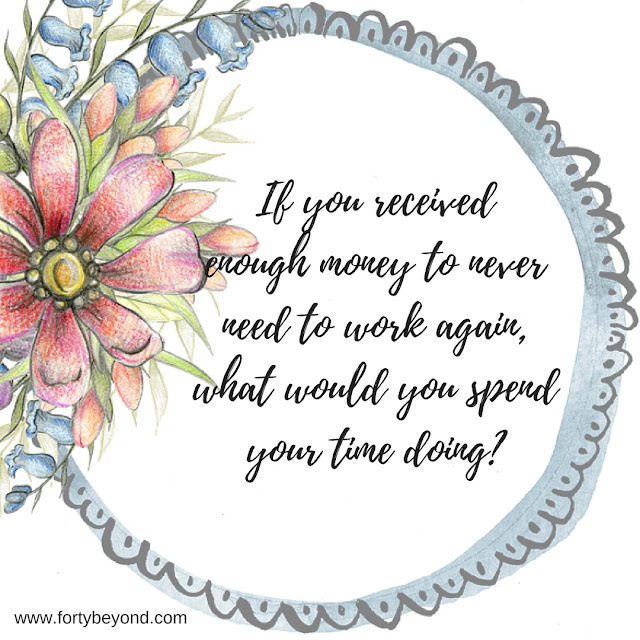 If you received enough money to never need to work again, what would you spend your time doing? I will tour the world with my kids on a cruise ship (Alaska tour). Wow love that. I haven't been on a cruise ship and it's on my bucket list for the longest time. I just need to save up enough money for the ultimate cruise experience. Hmm, I'm not sure. Probably traveling more, that's for sure! I'd also like to volunteer and donate at different charities. I donate randomly at different charities most of which are involved with kids. I would spend my time homeschooling my daughter! I love time with her! I've got friends who home school their kids and they share photos of their activities together. So much better than traditional school! This is so tough! I would definitely want to move to the beach and be a scuba diving instructor! I would love to spend my time sharing my love and passion for life "under the sea" Such a fun post! Oh wow! Scuba diving instructor and I don't even know how to swim. My sister in law is having her scuba diving certification. She loves the the water a lot. Aside from cooking? Traveling would be a great idea. It would be nice to see the world and interact with different kinds of people while also learning about their culture and tasting their food! That would be lovely. Well they say you need to eat and taste their food to truly experience the country. So far I love eating whenever I go to Singapore. I think I would still work in some way - my work is my blog and my blog keeps me sane, so even if I didn't need to write it I still would. Though I wouldn't spend as much time on it. Once a writer, always a writer :) I will definitely keep on blogging too. I want to travel whole world.. It's my wish to travel with my family and show them new places.. Traveling and working on fun hobbies such as painting and learning. Its always time to grow and do new things, but traveling way more would be at the top of the list. I had this question ask the other day. I would read, learn, travel and help people who are not so fortunate. I will spent my time with my family and taking care of my son until she grows older. and of course, traveling. I would donate and try to help the less fortune. Charities like ones concerning: foster kids, kids with cancer, and the homeless. I would also try to give my kids and family the best life they could have. I would not quit blogging, as I love it so much now. Thanks for this question it really made me think. I think I would just relax, ahahah! Enjoy all the little things I sure miss everyday because maybe I'm too busy! If this were the case, I believe I'd still continue with my business. I love helping others and watching them thrive. I would be doing two things with the money. One would definitely be to travel to some places I always wanted to go. But the other would be to put aside money for my daughter so she could live comfortably. I would absolutely love to spend more time to travel. There is nothing like exploring a new place. I would travel and also write. I think I would maybe even find the time to finish my first novel! Yes to traveling. One of our dreams to do. And while doing this, is to help some small communities, a way to give back.